Our monthly SEO service includes rregular and ongoing review and update your site as is needed to make it excel when reviewed by the search engines moving your website to the top of search results. Also included are regular automated and manual submissions of your website to the major search engines and a variety of smaller search engines. To track the results, included with every monthly subscription is our custom reporting system which allows you to get real-time updates to vital information regarding your website's ranking and effectiveness of keywords site up-time, and much more. SEO is an ongoing process that gets your sight FOUND when potential customers are searching for your products or services. 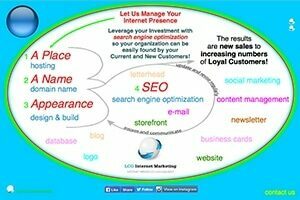 Search engines determine how to rank your website based on many factors. They use software called a 'spider' to crawl your site. They each have an algorithm which is regularly modified to improve their ranking systems. This includes virtually every aspect of your website. From the keywords used on your site in the copy, meta tags for images, and in descriptions of images. How quickly your site loads. Does it have any videos? Is it an "expert" site or do they have links to your site? Is your site mobile friendly? This is a big factor in your ranking since it started to be included last year by Google. Test your site with Google here. With our monthly service, every aspect of your website is under scrutiny. We will make whatever changes are needed to improve your rankings over time. We review rankings, feedback, and results from the various search engines your site is being submitted to, and use other analytical tools to revise and update your website content. This includes the content your visitors see and that which is inspected and used to determine your site's ranking for each key word or phrase. When a search is done for your products or services your website will be at or near the top of the organic list. With SEM your site can be at the top of the list and found via advertisements placed on social and other sites. Social marketing, regular copy and content changes and expansion, on a regular basis is recommended to improve the ranking or your site. We will advise if any major copy changes need to be made and expand your social presence to get you found. We'll provide recommendations and suggestions as you would expect any professional adviser to counsel you with insights to leverage you internet presence. Your purchase of SEO Setup is required prior to the monthly fee being provided and it includes the first 30 days of submissions and access to our Google Analytics reports for your site. Save! Buy one year of SEO service and get 1 month FREE! Select 11 months you will receive one more month free.